I call these ’emergency cookies.’ I make these quick cookies anytime an emergency strikes. My most common emergency is last-minute dinner guests. Last-minute dinner guests are quite common around here, because I love a good challenge. Other times, I put a lot of effort into making a meal, and then 20 minutes before my guests arrive I slap my forehead because I can’t believe I’ve forgotten dessert (again!). Monday is also an emergency. You know, every Monday. We all need cookies after the first day back to work from the weekend. My most recent emergency with these cookies was that I couldn’t stop eating marshmallow fluff out of the jar with a spoon. I had to get a hold of myself. Last week, someone from our Church dropped by the house unannounced. Did I have my Southern belle card on me? Was there a fresh pitcher of sweet tea in the fridge? Was the house spotless? Was I wearing acceptable clothes and a cute apron? No. I was sitting on the couch in yoga pants reading the latest issue of Martha Stewart Living, and in my clenched little fist was a spoon dipped in marshmallow fluff. It was not my finest moment. My Southern belle card has been temporarily revoked. I stared down at my sticky little fist and knew I had to put the marshmallow fluff to good use before it got the best of me. I turned to my easy, 4-ingredient peanut butter cookie recipe. These cookies do not contain flour, so they are perfect for baking up a quick batch for my gluten-free neighbor. They don’t contain butter, so I don’t have to let a stick of butter soften on the counter. They’re the perfect cookie all-around: easy, quick and gluten-free! In a medium bowl, combine the peanut butter, sugar and egg. Stir together very well until incorporated. Take one tablespoon of the marshmallow fluff and drop it into the batter, breaking it up as best you can with your fingers. Repeat for the remaining 2 tablespoons of marshmallow fluff. Gently stir together; you want to leave some streaks. Drop heaping tablespoons of the dough onto a baking sheet lined with parchment or a silicone mat. (You can also take the last tablespoon of the marshmallow fluff and use it for the top of the cookies before baking to create a crunchy burnt marshmallow crust). Bake for 10-11 minutes. Let cookies cool on sheet for 3 minutes. Move to a wire cooling rack to cool completely. *Try to use regular peanut butter here, not a natural one with oil separation. For some reason I find it hard to believe that you could ever forget dessert… but I’ll let it slide because these cookies definitely make up for it! These cookies are killer! Wow! I love all the peanut butter. That always makes for a delicious cookie, but then there is the marshmallow too!! Crazy! Oooh, I love 3-ingredient PB cookies. But the 4th here sounds EXTRA yummy! Will have to give te marshmallow fluff a try next time! I always need some emergency cookies. PERFECT!!! Emergency cookies are the best…especially with only 4 ingredients! Sounds awesome! LOL, you with the fluff just described the scene every time our apartment maintenance guy stops by. He must believe I live in college apparel. You get your Southern belle card back just for posting these guys :) And YES, Monday is always an emergency. ALWAYS! Everyone needs an emergency cookie! 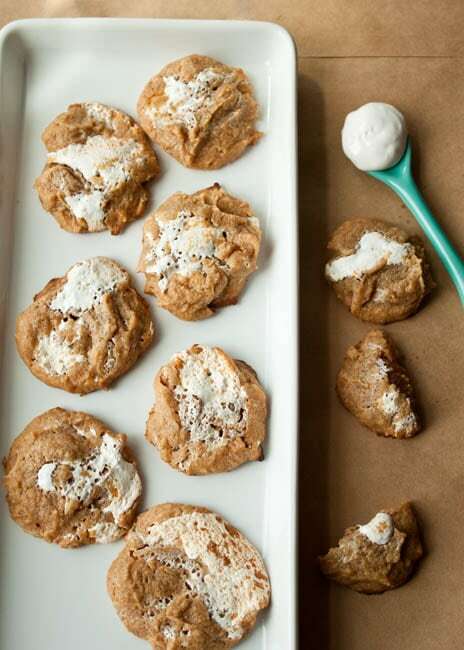 These look and sound great – anything with peanut butter and marshmallow fluff has to be! Yum. I’m glad these don’t take long to make, because I really want a couple now! I’m the same way with marshmallow fluff, It’s so hard to stop eating! I made a recipe similar to this when I had to bring something gluten free to a party, but I never thought about adding marshmallow fluff. I loved those cookies so I can’t wait to try this version! These are the best emergency cookies ever! I have half a jar of marshmallow fluff waiting to be baked into these! I try to keep some balls of cookie dough in my freezer for emergencies, they act like place and bake cookies! But these cookies are wonderful. what a great recipe! I make these 4 ingredient PB cookies all the time. My hubby loves them! I wish I was a Southern Belle like you but if somebody popped over unexpectedly I would most likely be – in workout clothes drenched in sweat sitting on the couch with a complete disaster of a house around me and only weird paleo food in the house. lol. I really, really do not like unexpected visitors. Guess it is a good thing I live in an apartment with a broken buzzer, huh? My main problem with unexpected guests is that I’m very likely not wearing pants…Yeah, I never had a southern belle card to revoke. Sigh. My great-grandmother is spinning in her grave. Ha, I have an emergency cookie recipe too! It’s always a good one to have up your sleeve and these look just perfect for those kind of occasions. Emergency! I NEED THESE COOKIES! Stat! I say you get your Southern Belle card back! This recipe is fantastic! I want these as an emergency “eating my feelings” kind of cookie! Love that there are only 4 ingredients! These cookies look awesome and I love that they require so few ingredients! I made something similar but with cookie butter instead of peanut butter and I basically inhaled them, so i can’t wait to try these! Why have I not put marshmallow fluff in my cookies before?!! Wow, these are amazing! So simple looking and so delicious! Pb and marshmallow is my favorite flavor combo! These cookies look fab and are so easy to make. And I am never ready for company. Emergency cookies! What a great concept. These look like they would be perfect for a tailgate! I love how easy these are!!!! I want to try them! Bookmarked! I could use an emergency cookie like this everyday around 3 p.m. Great recipe lady! 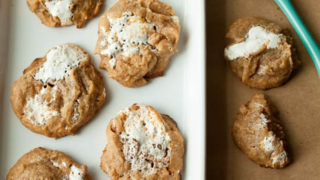 Peanut butter AND marshmallow fluff in one cookie?! Let’s be best friends…! I have a stash of recipes like this- sometimes you just need dessert in a pinch huh? I am relatively new to the “fluffernutter” combo- but it sounds amazing. Gotta keep this easy recipe on hand! Peanuuuuuuuut butter! I love that these come together in a pinch! Definitely an emergency Monday cookie although I’d gobble them down any ol day of the week. Love the creative idea! I can’t even believe this worked! I CAN NOT WAIT to try! These look absolutely perfect! What beauties! Love this.. thanks for sharing! I love this post! And of course, these cookies sound amazing! Are these cookies supposed to crisp up when completely cooled?? Mine were rubbery Is there too much egg?